So I had tried to film an update but… that didn’t go so well. So you get a post instead. First off, I want to thank everyone who has boosted the signal so far on this. I got support from people I didn’t expect to get it from, and honestly, I’m so grateful for everyone who has retweeted it, posted it on Facebook, G+, Instagram, on their own blogs, on forums and email lists… Really, thank you. 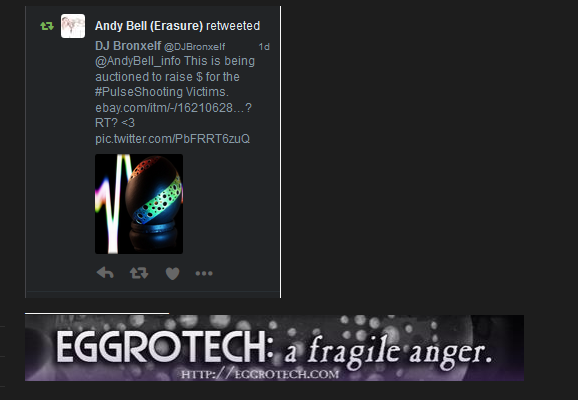 I did have a moment I truly didn’t expect when the egg got retweeted by Andy Bell. And if you don’t know who he is, stop right now, and go look it up. I won’t lie, I ran around in my living room in a circle. Because seriously. Andy Bell. As of right now, the egg has five bids on it and currently is sitting at $172.50USD, and has 4 watchers. Almost 1000 people have seen it. But the auction is long (I made it long to give it the most possible chance) and that means more PR, which I am admittedly terrible at(truly. Awful.). So please, keep letting people know about it. I’d love to see it hit $250. The auction is here: http://www.ebay.com/itm/-/162106283809? I should have another egg(a regular one) up by morning – it’s done, I just have to shoot the photos, etc.